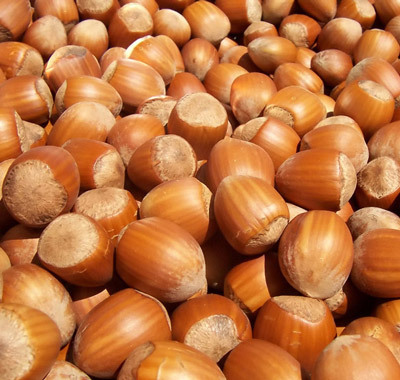 Hazelnuts, also known as filbert nuts or cobnuts depending on their species, are produced by hazel trees, which grow in temperate climates in many parts of the world, although they are native to Europe and Asia. A cob is oval or spherical while a filbert is more elongated. After pollination, it takes about 7-8 months for the nut to ripe and fall out of the husk. Turkey is the largest producer of hazelnut in the world and in the American states of Oregon and Washington hazelnuts are produced in large commercial quantities. Chile, Australia and New Zealand also produce hazelnuts. Hazelnut wood is used to make bows. The hazelnut trees grow with fairly straight shoots and they have fine grains, that makes them suitable shaft material. The distinctive slightly bitter flavor of hazelnuts is suitable for use in savory and sweet dishes, although the nuts are most frequently used in desserts, especially paired with chocolate. Hazelnuts are mainly used in confectionery to make praline. Hazelnuts or hazelnut paste are extensively used in chocolate industry for making different products like Nutella and chocolate truffles. The strongly flavored hazelnut oil is used as a cooking oil. Hazelnut butter is considered as a pleasant and nutritious spread and hazelnut is also popular as a flavoring agent for coffee, especially in the form of hazelnut latte. Hazelnuts generally ripen in late August, which is the best time to find the flavorful nuts. Most grocery stores carry hazelnuts year round, often unshelled and raw. Hazelnuts are also sometimes sold preserved in their own oil. The hazel tree is a fast growing deciduous shrub which produces catkins, which open in the spring. The catkins mature into groups of as many as five nuts, often hidden under the serrated green leaves. Because hazel is fast growing and easy to shape, it has a long history of use in hedging, especially in England. Left alone, hazel can reach a height of 49 feet (15 meters). The shrub also provides habitat to numerous animals and birds, as well as serving as a source of food for butterflies. The alternate name of the hazelnut is filbert. The exact reason for this common name is unclear, although the nuts do tend to mature around the time of the feast day of St. Philbert. Some people distinguish between hazelnuts and filberts, arguing that filberts are actually a different type of nut, although the two are related. People who differentiate between the two believe that filberts have slightly longer shells. When they are shelled, however, the two nuts look identical. The shell of a hazelnut is brown, glossy, and roughly ovoid. Once shelled, the hazelnut still has a bitter dark brown skin, which many people remove before cooking the nuts. The flesh of hazelnuts is white, and slightly sweet when the bitter skin is not present. Many cooks toast hazelnuts before using them to enhance their mild flavor. The nuts appear ground with chocolate to make spreads, mixed in with stuffings, in hazelnut torte, and on a variety of other desserts. They can also be pressed to yield a dark, flavorful oil. To select the best hazelnuts, look for plump specimens without any sign of shriveling, and plan on using them within one month or freezing them. If the shells of the hazelnuts are still on, look for smooth, glossy shells with no signs of cracks or holes, and shake them. The nuts should not rattle in the shell, as this indicates that they have lost moisture. The following table illustrates hazelnut nutritional value per 100gm or 3.5oz. The source of above data is USDA Nutrient database. As you now know about the hazelnut nutrition facts, let us now have a look at the hazelnut health benefits. Hazelnuts are packed with essential oils and supply a well-balanced mixture of vitamins and minerals. Hazelnuts contain about 75 percent mono-unsaturated fat and less than 4 percent saturated fat. Filbert properties were first pointed out by the Greek physician Dioscorides 1800 years ago, "It cures chronic coughing if pounded filbert is eaten with honey. Cooked filbert mixed with black pepper cures the cold. If the ointment produced by mashing burnt filbert shells in suet is smeared on the head where hair does not grow due to normal baldness or to some disease, hair will come again." A study conducted by Italian researchers has confirmed the presence of taxanes in the shells and leaves of hazel plants. The finding of the essential elements in shells and leaves, which are considered discarded material is a good sign for the future availability of paclitaxel 'Taxol'. Here is an overview of the health benefits of hazelnuts. Hazelnuts are a good source of energy with their 60.5% fat content. They are rich source of vitamin E which helps prevent oxidation of the polyunsaturated fats. Hazelnuts are high in oleic acid, a mono-unsaturated fatty acid, which helps to lower cholesterol. The cardio-protective arginine, an amino acid from hazelnuts helps in the relaxation of blood vessels. Only a few nuts contain vitamin A, and hazelnuts are among them. Vitamin A is a natural antioxidant and has cancer-preventing properties. They also provide you proteins but for that, combinations with other nuts, grains or legumes are required so as to avail the maximum benefit. Hazelnuts rank number one among tree nuts in folate content. Folate is responsible for a decreased risk of neural tube birth defects and it reduces depression. Hazelnuts are rich in minerals, particularly in manganese, selenium and zinc. The minerals calcium, magnesium and potassium from hazelnuts help to lower cholesterol. Hazelnuts contain nearly 75 percent mono-unsaturated fat and less than 4 percent saturated fat. This high level of mono-unsaturated fat is credit-worthy for a reduction in both total blood and LDL cholesterol levels, provided hazelnuts are consumed as part of a low saturated fat diet. Plant compounds such as carotenoids, flavonoids, and proanthocyanidins are the phytochemicals that play an important role in decreasing the risk of heart diseases, cancer and other chronic diseases. Hazelnuts have the highest proanthocyanidin content of any tree nut. These elements offer astringent flavor to foods and may help reduce the risk of blood clotting and urinary tract infections. Taking into consideration hazelnut nutrition facts and health benefits, hazelnuts are placed in a 'heart healthy' food group. 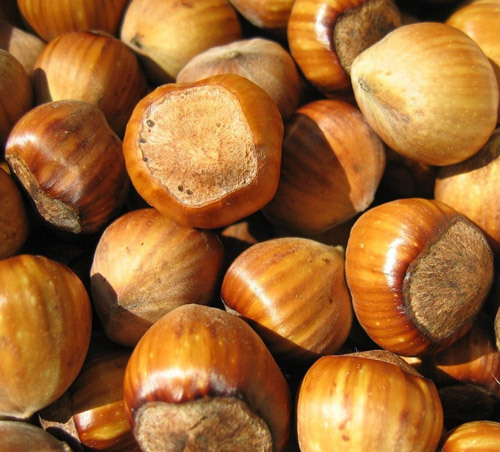 Natural, roasted and blanched hazelnuts, all are considered as healthy for heart. Hazelnut seems to be safe for most people in food amounts. But some people are allergic to hazelnuts and have had serious allergic reactions including life-threatening breathing problems (anaphylaxis). People who are allergic to peanuts, mugwort pollen, Brazil nut, birch pollen, and macadamia nut might also be allergic to hazelnut.